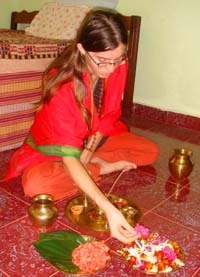 Eleanor studied at Shri Kali Ashram for three years. She now lives in the Sacramento area where she is an Engineer with the California State Water Resources Control Board. She has a MS, Civil & Environmental Engineering from the University of California, Davis. She is a registered E-RYT 200™ with Yoga Alliance® and RYT 500™ and frequently teaches Tantra Yoga workshops in and around Sacramento and remains very close to the workings of the Ashram. 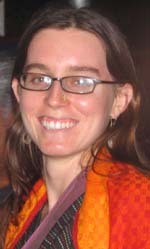 Eleanor came to Shri Kali Ashram after serving for several years with the U.S. Peace Corps in Madagascar. (She is fluent in the Malagasy language.) She came for a short stay to learn āsanas. However, after realizing that there is much more to the science of yoga, she stayed on in India and persevered in her training. She performs very advanced āsanas. During her time at Shri Kali, Eleanor has grown from a quiet, nerdy girl to a strong, intelligent woman with a free spirit. Eleanor is proficient in Tantra and Yoga. She is a skillful and popular teacher, and is appreciated by new students for her clear understanding and ability to explain the Tantric and Yogic philosophies. Students who have attended her classes often comment on the wholesomeness of the experience. She also reads fluent Sanskrit and knows by heart the mantras and rituals of the Kālī tradition, which she practices.